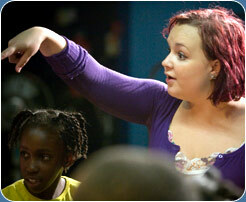 Creative Minds goes into Primary Schools to deliver bespoke workshops in performing arts. Over the last five years we have worked with the following local primary schools Keyworth, St Pauls, John Ruskin and Comber Grove amongst others. Creative Minds works with both small and large groups of students from Reception, KS1 and KS2. We work in curriculum time, offering workshops that link with the student’s curriculum or which addresses key social issues identified by the school. Our workshops can be delivered as part of an intervention plan or as a gifted and talented opportunity. 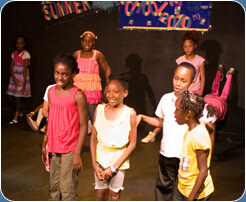 We also deliver a variety of after-school clubs focusing on dance, drama and music. At the end of the workshop series, we offer the opportunity to hold a celebration performance at either the Blue Elephant Theatre or at the school, so that parents, carers and fellow students can celebrate the success of all the participants involved. Creating a devised piece on Monsters at St Paul’s Primary (watch a video of the session). Ongoing intervention work with language skills and confidence with John Ruskin Ethnic Minority Achievement groups. Creating play on the Cyber Bullying with Y5 at Comber Grove Primary. Delivering John Ruskin’s end of year production of Matilda the Musical. Students engage in classes that work confidence and skills using improvisation, script, movement, dance, voice and singing. Creative Minds workshop leaders liaise with the school on a regular basis to make sure your school’s objectives are achieved. Every year, Creative Minds works with over 600 primary school children. "The confidence that has been developed in our SEN and EAL children has been outstanding! These children, who usually shy away or use avoidance techniques, have made significant progress in just half a term! Children lacking in confidence have become much more expressive. Those with behaviour problems due to short attention spans have become more focused, engaged and responsive."